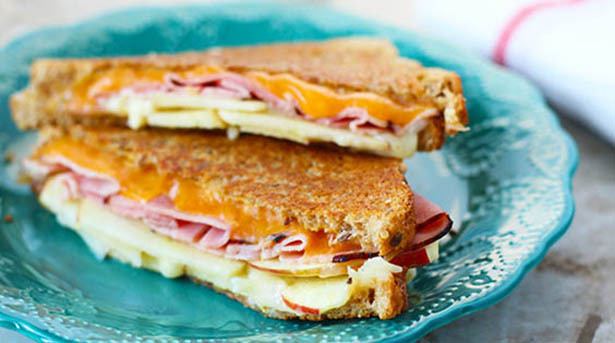 Placing cheese on both slices of bread works as a “glue” to keep the ham and apple slices tucked neatly inside. Try using a hearty, multigrain bread with flax seeds to give this sandwich a nutty flavor. Heat a nonstick or cast-iron skillet over medium heat. Spread Dijon mustard evenly on each slice of bread, then place 2 slices of white Cheddar on one slice. Place ham on top of cheese, distributing evenly. Add apple slices on top of ham layer, then finish with yellow Cheddar and remaining slice of bread. Spread top of bread with softened butter and place that side down in heated pan. Cook for approximately 4 minutes (if necessary, turn the heat down so the bread doesn’t burn). While sandwich is cooking, spread remaining softened butter on top of bread. Flip sandwich over and cook another 3-4 minutes or until lightly browned.